People are calling today the "big dig," as the east-coast snowstorm has now passed and it's time to start cleaning up. One of the advantages of living in an apartment instead of a single-family home is most apparent on days like today. Still, I know a lot of people are going to be outside shoveling snow today. It's brutal work. When you're done, in addition to being worn out, you're cold and possibly soaked depending on how well your clothing and shoes are waterproofed. So you'll want something to help warm you up and make you feel better. And for that, there's the Hot Toddy. This classic winter warmer is also good for you if you have a cold--apparently even scientifically proven, at least according to this source. 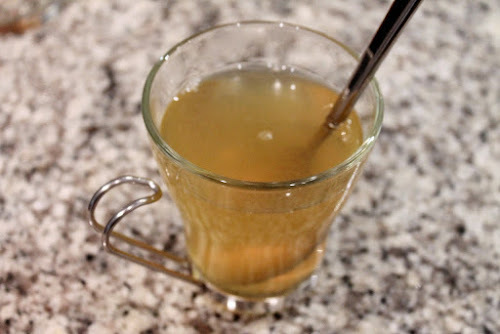 There are variations on how to make a Hot Toddy, but the basic formula is a brown liquor (whiskey, brandy, rum or Scotch work great--I bet even tequila would do the trick) with honey, lemon and hot water. If any cocktail can be considered a "comfort food," it's this. 1 1/2 oz. bourbon whiskey (may also use any other type of whiskey, brandy or rum). Combine water and honey in a tempered glass or ceramic mug and stir until the honey is dissolved. Stir in the lemon and bourbon. Serve warm.